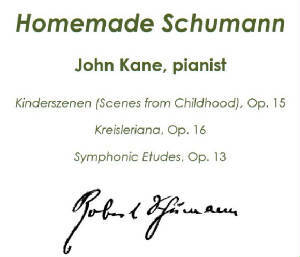 Homemade Schumann was recorded in May, 2014, and contains three major works: Kinderszenen (Scenes from Childhood), Op. 15, Kreisleriana, Op. 16, and the Symphonic Etudes, Op. 13. This album is available as a full-length CD for $25 + S/H or individual tracks listed below can be purchased as MP3 downloads. Please click on track number below to hear a brief excerpt.